Fates of Madness is a new RPG card game up on Kickstarter. Instead of having books and paper, you play using your decks of cards. Head down into the dungeons, defeat all manner of monsters, and come away with some sweet loot. It's everything you want in an RPG, but without all the tedious page-flipping. 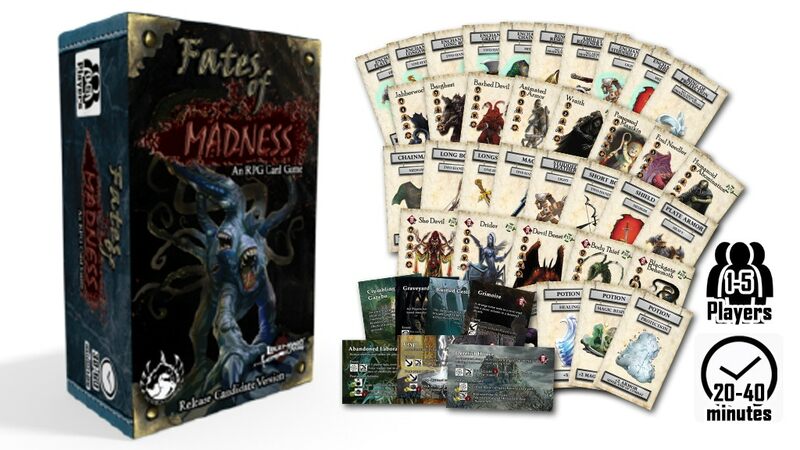 Legendary Games launched the Fates of Madness Kickstarter, a RPG card game! This project is intended to create a rules-lite cooperative card game with challenging playability. This horror themed adventure is based on the Gothic Campaign Compendium project and is the first joint project between Legendary Games and Mythica Gaming. You'll find seven scenarios and six monsters that four adventures will have to succeed using skill checks, combat, and spells. Fate cards and madness can have surprising outcomes. Will any of the players survive or will the game end in a total party kill? Six characters to choose from with more planned as stretch goals this game plays up to five players using an optional GM or play it solo! Dozens of equipment, potions, and treasure cards allow the adventurers to prepare for the ultimate battle with the boss monster! A selection of sinister boss monsters awaits the party in an ever-harrowing destiny! The campaign is making its way to 1/2 funded with still 25 days left to go.